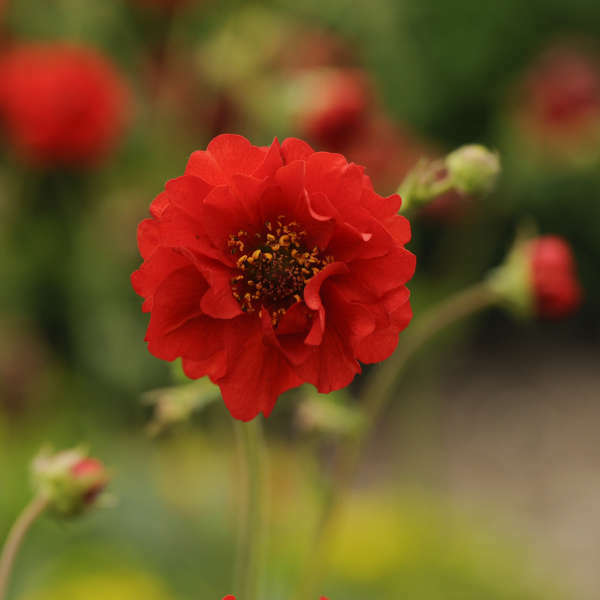 Geum flora plena 'Blazing Sunset' | Walters Gardens, Inc.
From the Thompson & Morgan breeding program comes this delightful fully double, scarlet red geum. 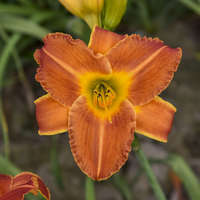 Its flowers measure up to 50% larger than other varieties and they continue to bloom over a very long period from late spring into summer. Enjoy them as a cut flower in fresh bouquets. 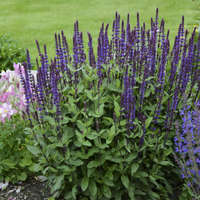 The fuzzy, green leaves form an attractive mound that makes a good filler for the front or middle of the flower border. Geum is a fast grower that is rarely bothered by pests or diseases. 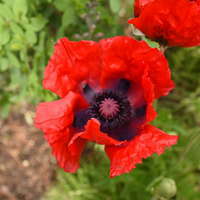 Easy to grow and underused in today's gardens. 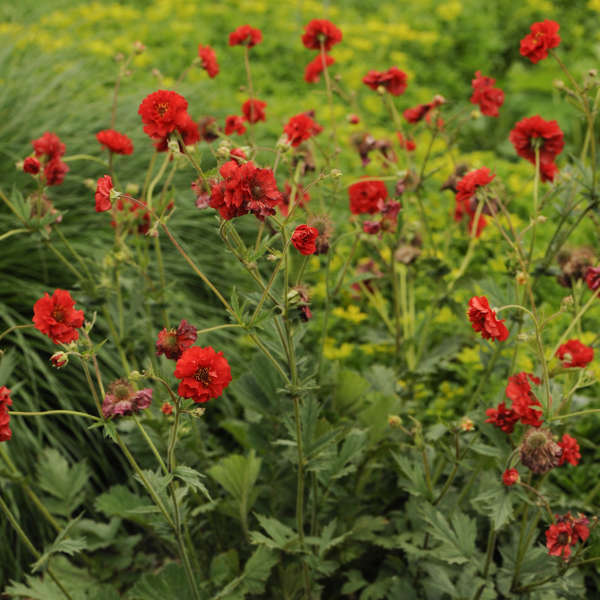 Geum adapts well to both hot summers and cold winters without complaint. This species prefers moist soil with good drainage. In southern regions, protection from hot afternoon sun will improve the look and health of the foliage. 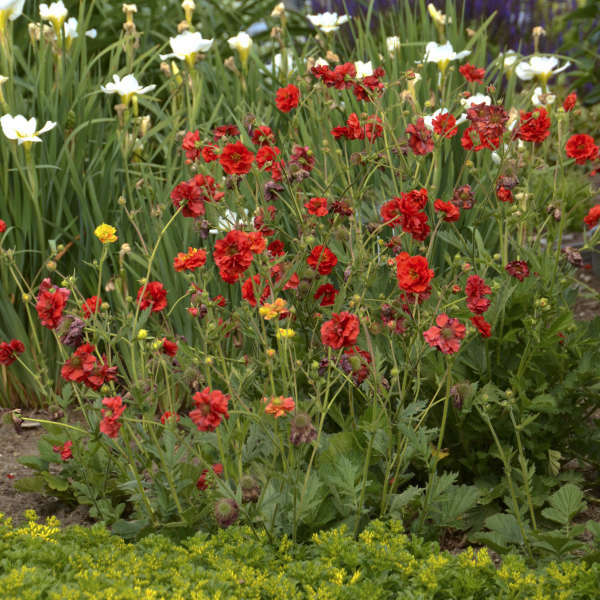 Geum should be divided frequently; young or newly divided plants bloom longer and stronger than older ones. Deadheading will promote a longer flowering time and rebloom. Geum will grow well using low to moderate fertility levels. Using water soluable fertilizers, apply 150-200 ppm of nitrogen as needed or with a constant liquid feed program using rates of 75-100 ppm nitrogen. If using controlled release fertilization, use as a top dressing on the soil surface using the moderate labeled rate. This can also be incorporated into the potting media at a rate equivalent to 0.9 to 1.1 pounds of elemental nitrogen per yard of media. Cold beneficial. Flowers earlier and more profusely following a cold treatment. Occasionally: aphids, black vine weevil, leafminers, and spider mites. Plant in late winter to late spring in a well drained soiless media. Keep uniformly moist, but not consistently wet. Liner soil line should be placed even with containers soil line. For control of flower height use Bonzi at 30 ppm or Sumagic at 5 ppm as stems begin to emerge from the foliage. Several applications may be needed at 7-10 day intervals. Day Neutral. Flowers under any day length. If early season sales are required, then it is recommended to plant small plugs in late summer or early fall to bulk and vernalize before forcing into flower.